The namesake of this park is James A. Sherry (1889-1955), the Chief Park Administrator under former Parks Commissioner Robert Moses (1889-1981). For 40 years, Robert Moses served as the master builder of the City of New York. He played a primary role in the development of its parks, transportation, and housing. Beginning in 1924, he held a dozen city and state positions, many concurrently. Invested with this authority, Moses constructed 416 miles of highway, 13 bridges, 658 playgrounds, 17 miles of beach, 11 swimming pools, zoos, recreation centers, and ball fields; he more than doubled the city’s park acreage to 34,673 acres. Moses is remembered as the man who built the city that New York is today, and aides such as Sherry were integral to his success. James Sherry was born on June 18, 1889. As an adult, he lived at 210 Clinton Avenue in Brooklyn with his wife, Elizabeth, and son, James A. Sherry, Jr. In 1913, Sherry came to work for Parks and in 1951, Moses appointed him Executive Officer. In January 1955, Moses promoted Sherry to Chief Parks Administrator, where his in-depth knowledge of the civil service was of immeasurable value. In 1952, Sherry was awarded the William Randolph Hearst medal for his enormous contributions to the city, and in 1955, he received a citation from Parks Association, Inc. Sherry retired in May 1955, and died just months later in his summer home in Center Island, Long Island, but he is remembered for his 49 years of dedicated service to the City of New York. In December 1936, the Regional Plan Association recommended the construction of a link between the Gowanus Parkway and the Triborough Bridge. What was then called the Brooklyn-Queens Connecting Highway was to be financed equally by Federal, State and City funds. The construction of the Kosciuszko Bridge over Newtown Creek in 1939 was the first piece of what would later become the Brooklyn-Queens Expressway, colloquially referred to as the BQE. The route of today’s BQE was adopted by Robert Moses in late 1945 and was constructed in the 1950s and 1960s. On November 17, 1955, the City of New York acquired this Woodside land in order to carry out renovations on the Brooklyn-Queens Expressway. Jurisdiction over this land was conveyed to Parks later that day. 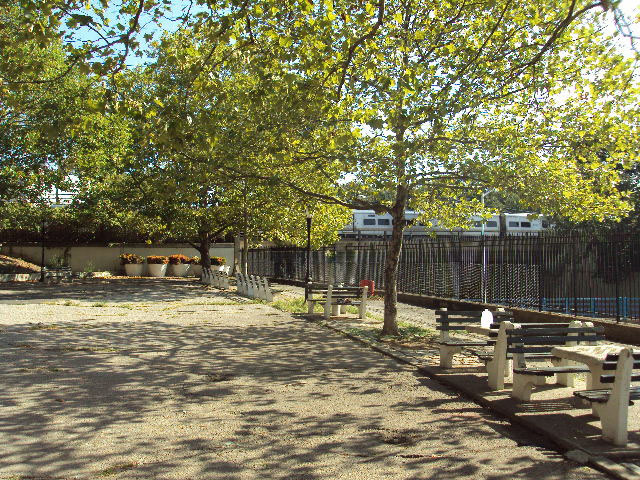 Renovations on this land included modifications of the lines and grades of the street system and the laying out of six “sitting parks.” The parks were named on June 18, 1987. Two were called Crosson Green and Crosson Park. The other four – Jennings Park, Latham Park, Sherry Park, and Spargo Park – were all named for the most prominent and dedicated of the “Moses Men,” for their many years of service to Parks and New York City. Sherry Park resides at the intersection of Queens Boulevard and the Brooklyn-Queens Expressway. Its facilities include several sitting areas with game tables, and a large, open play area with trees and benches.